17:14 When he saw them, he said to them, “Go and show yourselves to the priests.” And as they went, they were made clean. 17:17 Then Jesus asked, “Were not ten made clean? But the other nine, where are they? Last Sunday a group of our third through fifth graders gathered at the church in the afternoon for our own Charlie Brown Thanksgiving dinner. If you’ve never seen “A Charlie Brown Thanksgiving”, or if it’s been a while, let me remind you what was on that menu: jelly beans, toast, popcorn, and pretzels. Not exactly turkey and mashed potatoes, but our kids seemed happy. Their parents, who we sent them home to after giving them lots of sugar? I’m not so sure. Regardless, spending the afternoon with them helped put me in the Thanksgiving mood. That’s in part because as long as I can remember, “A Charlie Brown Thanksgiving” has been a part of my Thanksgiving tradition. We always watched it in my house growing up. And I love it, except for one thing. The story revolves around Charlie Brown, and Thanksgiving dinner. Charlie Brown is supposed to go to his grandmother’s for Thanksgiving. But before he can, his friend Peppermint Patty calls him and invites herself, and a group of other friends, over to his house for Thanksgiving dinner. And then, when she comes to dinner and gets served the improvised menu of popcorn and jelly beans, she criticizes her host and tells him that she is having a terrible Thanksgiving because of him. That’s the part of the story that has always upset me, even as a small child. Because I always felt so bad for Charlie Brown who didn’t ask for guests on Thanksgiving, and who had done his best. And in the end he doesn’t even get a “thank you”. Jesus tells them to go and see the priests, and as they leave he heals them. All ten of them suddenly are clean. No more leprosy. No more being outcast. No more pain. They are only a little ways down the road from Jesus when this happens, and they suddenly realize they have been healed. And as soon as it happens one of them, a Samaritan, turns around and runs back to him. And he begins praising God, and falls at Jesus’ feet thanking him. When we read this story, we all know what the other nine should have done. They should have come back, right? They should have praised God. They should have said “thank you”. 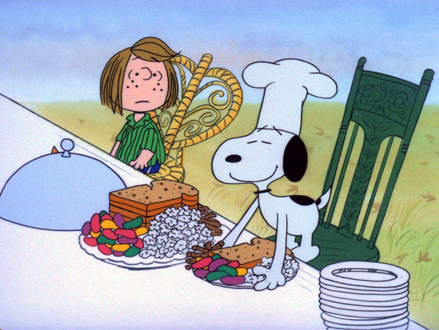 It’s as obvious as the fact that Peppermint Patty shouldn’t have invited herself over for Thanksgiving dinner. And any of us who grew up being told to write thank you notes, and have good manners know that. But is this really just about good etiquette? Or is it something more? I believe good manners and thank you notes are important, but I also believe that the Gospel is rarely just about social niceties. Jesus wasn’t upset that he was missing nine thank you notes. It went much deeper than that. And that’s because this is about gratitude. And gratitude always goes deep. Because gratitude is about more than just saying “thanks”, though that’s important. It’s about living a life of thanksgiving. That’s an important distinction to make this week as we approach Thanksgiving Day. Because come Thursday we will be sitting at our tables, enjoying dinner, celebrating with friends and family. And there may even be that moment when everyone goes around the table and names something for which they are grateful. And that’s all wonderful. But, if that moment of gratitude ends as soon as the pumpkin pie is put away on Thursday night, then we are doing it all wrong. Because giving thanks is not something that should happen once a year. Hopefully we know that, but sometimes our actions don’t always show it. Many others have pointed it out, but have you ever considered the irony of how on Thanksgiving we talk about how grateful we are for all we have. And then the next day (or even that same night) we start the annual run-up to Christmas where we try to get even more? I think it goes to show that gratitude is an incredibly fleeting feeling. It doesn’t take long to lose. I think that’s because gratitude takes work. Because the thing about gratitude is that it’s more than just counting our blessings. Like I said last week, we aren’t blessed just to be blessed. We are blessed for a reason. And likewise, when we receive grace of any kind, it’s not enough just to receive it. We are called to do more. We are called to respond to it. And that’s what gratitude is all about. It’s about responding to the grace we have received. And when Jesus healed the ten, and only one showed any kind of response, any kind of gratitude, I think that’s what bothered Jesus the most. It wasn’t just Peppermint Patty inviting herself to dinner. It was Jesus offering something life changing, and only one out of ten recognizing it. Because in the end, that’s what it means to be grateful. It’s to see the way your life has been changed by the blessings you have received. And it’s about more than just saying “thank you”. It’s about deciding to live your life as a “thank you”. And maybe he wanted to know that they had been healed for something, and not just from something. We can read this story and think, “How could their lives not be changed?” And we reassure ourselves that we would do things differently if we were one of the nine. But sometimes I wonder, “Would I?” I sure hope so, but I’ll bet those nine people who kept on going thought they would too. And I wonder, did they keep going because they somehow justified it? Did they think maybe they had deserved the healing? Did they think they had done it themselves? Were they so excited they forgot to turn around? Or, when the healing happened, did everything change so radically that all they could think about was “what next”? And all of a sudden they had a whole other set of things to worry about. I think we’ve all had those experiences. We have wanted something so badly that when we got it we forgot to be grateful. We just moved on to the next step, the next want. I think that’s why all too often Thanksgiving becomes a once a year holiday, and not a daily practice. But what if it doesn’t have to be that way? People in the recovery community have long used a tool called a “gratitude list”. The idea is that when things feel hard, or when it feels like nothing is good in your life, that’s when you make a list of all that you have to be thankful for. The first time someone told me to make a gratitude list I immediately felt less-than-grateful for them. But I tried it. And what I found is this. There is no way, for me at least, to make that list and not feel grateful. You start with the easy things: I have a warm place to live, I have enough food to eat, I am safe. And then you move on to the deeply meaningful things: I have people I love who love me. I have meaning. Until finally you reach this conclusion: I have more than I need. I have plenty to give away. I have a life I can give to God to use. Gratitude can change everything. Our mood. Our actions. Our lives. And the best news is this: it’s never too late. I don’t know what happened to those nine who didn’t come back to Jesus that day. But, I wonder if they came back later. I wonder if they were there in the end. Maybe they finally realized what they had been given, and they couldn’t help but to live their lives as “thank yous”. The same is true for us. We have all been given so much to say “thank you” for in our lives. It’s not too late to use our lives to say that thanks. And this week is as good a time as any to start. Last Sunday, before their Thanksgiving meal, our third, fourth and fifth graders all worked together on a craft project. They made turkeys out of paper plates and coffee filters and muffin wrappers. And they glued on leaves that said “you are blessed”. Those turkeys will go out today in our Thanksgiving baskets which are going to people who need the meals. But I think our young people got that those leaves that said “you are blessed” were meant for them too. I think they understood that as afterwards they filled their plates with jellybeans and popcorn and we watched Charlie Brown. Because I think that sometimes the ones among us who still find joy in the smallest of gifts, even an afternoon spent serving others and having a little fun, understand gratitude the most. I hope it’s something we continue to teach them, this intersection of joy and gratitude. But, equally important, I hope it’s something they continue to teach us. Because this Thanksgiving, I hope we take a page from them, and that we live a life of everyday joy, and everyday giving. And may each day, from this November until next, be a day of living our lives as a Thanksgiving to God. Amen.